A talent that lacks management is a talent easily led astray, but he who is consumed by it will pursue perfection to the zenith of psychological collapse. The young hero in Damien Chazelle’s “Whiplash” teeters on this tightrope with silent contemplation, pushed there not because he really cares all that much about being great, but because he has something to prove to all those within his sphere of awareness. His problem is that the one standing at the focal point of observation also happens to be the most toxic. His name is Terence Fletcher (J.K. Simmons), and he walks with almost predatory authority through the halls of the Shaffer Conservatory of Music. All those within sight of his piercing gaze dare not stare back or instigate conversation; they are clearly all spare parts in his toolbox of supplies, to be used at whim if he ever deems it necessary. Young Andrew (Miles Teller) does not wonder where such a man managed to acquire such commanding influence over so many subjects, and the results speak for themselves: he is a champion competitor with a long line of achievements cementing his power, and all who play jazz in the lower echelons foolishly wait for the day when he will wander into their midst and offer a nod of acceptance. Perhaps it is Andrew’s deep desire to find approval beyond the scope of simply being a good musician that initially makes him so attractive to Fletcher, who sneaks up on him in an early moment playing drums like a wolf ready to seduce willing prey. In truth, Andrew’s talent is probably no different than any other person who has ever passed through Shaffer’s halls with big dreams, but that isn’t exactly the point: it’s the fact that this towering force lets him believe that he has something unique by showing some momentary interest. And because Andrew is eager to pick up on that to the point of mugging for incessant positive reinforcement, that makes him the ideal instrument in this tyrannical conductor’s game: a kid who will do anything short of killing himself to be taken to the utter extremes of musical capability. When the blood from his fingers trickles through the drumsticks and onto the cymbals, it only emphasizes that prospect with shocking focus. There is almost a poetry to these themes in the hands of Chazelle, a relatively new filmmaker who focuses so intently on the obsessive nature of his characters that he takes us much farther into the psychological complexities of this situation than most would expect of such a premise. One could argue that a synopsis of “Whiplash” reads more like a Lifetime movie adaptation of a Reader’s Digest article than a launch point for great dramatic intensity, but seeing it fully fleshed into this compelling and brilliant film is to highlight the presence of a very perceptive observer behind the camera, a director that sees two crucial lives intertwine in a psychological dance of despair as they are consumed by their obsessions. For one, that passion is rooted in youthful arrogance that masks inner loathing; for the other, it is driven by a lifelong desire of impossible measure that haunts him like a reminder of past failures. 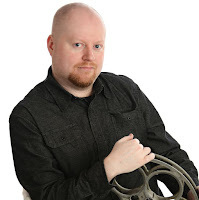 Was it ever possible for a man like Fletcher – who models himself after the likes of other music teachers who too used the threat of intimidation and violence as inspiring lessons – to find a terrific Jazz musician in the age where interest in the genre often falls on deaf ears? The more accessible point for movie audiences, I suspect, is obvious: at what point do you cross the line in your push for unchallenged excellence, and is it really worth sacrificing one’s own state of well-being for the sake of art? Perfection is an impossible quality to achieve in an imperfect human world, but the fascinating subtext that fuels “Whiplash” is that neither character is humble enough to admit so. For them, their behaviors are dictated by emotional extremes that blind them to all semblance of an acceptable reality, causing those who exist in the peripheral to look on with either forlorn sympathy or outright disgust. In the early minutes of the movie, Andrew is simply a jazz student strumming his way through class wondering what fates have in store for him. Others in his music room occupy similar attitudes, and when they spy the great but foreboding Fletcher standing at the classroom window, none (save for Andrew) are audacious enough to take notice. Occasionally, he will even wander into the room and begin conducting specific students – usually for brief five seconds intervals, which are long enough to insult their inability to be competent at the helm of instruments. Is Andrew any different than them? Perhaps not, but his desire to impress fuels him with admirable ambition, and the fact that he seems so ambivalent to the threatening nature of his superior is, I suspect, perceived as a delicious challenge. Soon after, Fletcher invites him into the company of his great studio band, charms him with words of optimistic light-heartedness (“just have fun!”), and then unleashes a nature so harsh and abusive that it reduces everyone around – including seasoned students – into blubbering babies incapable of sustaining self-confidence. The diatribes – often long, exhausting and charged with electric fervor – are delivered with astounding precision by J.K. Simmons, who often plays innocuous supporting roles in film and television. To see him embody such a rabid tyrant is at first startling and inconsolable, but he does not allow himself to be reduced to overplayed caricature; he owns the fully faceted persona of a madman until the last breath, and fills the screen with a sense of overpowering enthusiasm. 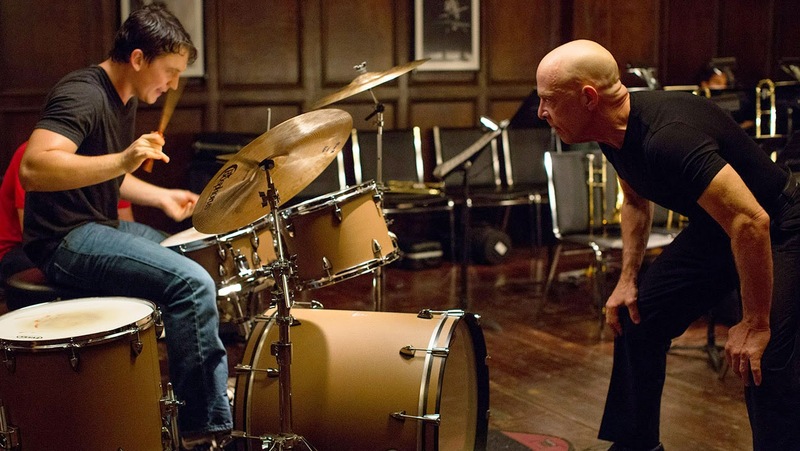 In most films he would upstage nearly all other narrative and character inclinations, but one of the many astounding qualities of “Whiplash” is that it modulates between him and young Miles Teller with an effective rhythm, and we become caught up in their conflict like observers with personal stakes. Fletcher’s tirades are dangerous and cynical (exemplified with glaring clarity in a scene where it is revealed that a student’s suicide has happened off-screen), but the only thing more powerful than his rants is Andrew’s own need to be great, and he agonizes over charts, rhythms and drumming sessions outside of class for hours upon hours in hopes that his endeavors will take him to the top of the heap. The climax, which occurs after plot situations have forced their paths into alternate directions, is a startlingly tense one that I simply did not anticipate. There is a moment during the buildup that is equally as brutal, in which Andrew rushes off to an engagement in a rented vehicle, is hit by a semi while not paying attention to traffic signals, and yet flees from the scene in order to make it on stage in time (all while bleeding and sweating profusely). What both moments highlight – at least beyond the severity of these obsessions – is that the director, so fresh and agile in his observations, has a knack for arriving at piercing human statements without drowning them in cumulative dialogue. The resolution is a lengthy battle of wits with almost no verbal exchanges, and yet the veracity of their interactions is tense, especially as their mutual hatred of each other is finally unleashed in the form of very ambitious music. Who is to say that Andrew could never become so great that he transcended human capability? Who is to say Fletcher would ever concede to the notion that everybody has an impossible breaking point? By the end, we sense they are so enamored by the masochistic nature of their hostile relationship that they would probably go extra rounds with one another just for the heck of it.